IN CUSTODY: Risto Harmat on his boat, which family and friends say he used a lot at Kadavu and is normally moored at Pacific Harbour. 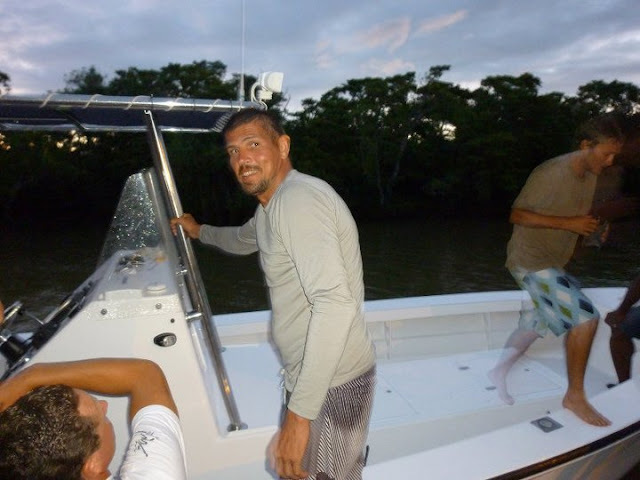 More on the Estonian fisherman believed to have skippered the boat that took Roko Ului Mara out on the water at Kadavu. Risto Harmat is from the island of Saarema in Estonia, in the Baltic Sea, and has been in Fiji eight years. He has a young son. Family and friends say they've managed to contact the Ministry of Foreign Affairs of the Republic of Estonia about his situation and help is imminent. Fiji police have interviewed about seven people, mostly Mara's family, plus two kaivalagis: close friend New Zealander, Anthony Fullman, and Risto Harmat who has been in custody for more than four days now. Harmat's worried family and friends have been trying to find him legal representation and say he's just a well-known fisherman with an excellent reputation for his catches. Harmat has been allowed two visitors and is understood to be in good health and hasn't been harmed. Family and friends are concerned, though, for his welfare and the effect hours and hours of interrogation would have on him. It's understood Anthony Fullman cannot leave Fiji just yet, despite telling one of the individuals also being questioned by police a few days ago at the same time as him, that he was to be deported to New Zealand. Come on Estonia, report the Bainivuaka to the European Union Court straightaway. i think its about time united nations intervenes..
well nz will do anything to get fullman out.. I bet the fiji Navy Frogmen are already figuring out a way to attach an Improvised Explosive Device to it. My advice to Risto: No more fishing my brother until after Democracy returns. Otherwise something will happen to your boat just like that Helicopter in which Qarase escaped in. An Australian pilot is dead after his helicopter crashed into the sea off Fiji. The 36-year-old Queensland man died when his helicopter crashed shortly after taking off from Nadi on Tuesday. The man, who worked for transport company Island Hoppers, is understood to have offered to take Fiji government officials to a safe haven following the Pacific island nation's coup. The Australian High Commission is liaising with local authorities to confirm details of the incident. An Australian Department of Foreign Affairs and Trade (DFAT) spokeswoman said it was understood the pilot was the only person on board the aircraft. "We have extended consular assistance to the man's family, who have asked that their privacy be respected," the spokeswoman said. The Fiji Times Online reported that an eyewitness saw the helicopter explode on the surface as it plunged into the ocean between Vuda Island and Bounty Island. Timoci Nasilasila, a diver from Viseisei in Vuda, said he was at home when he saw the helicopter go down. "It exploded on the surface before it went into the sea," he said. Nasilasila said that he and a colleague had recovered the pilot's earmuffs, identity card and some debris. Airports Fiji Limited spokesman Apenisa Nagatalevu told the Fiji Times the helicopter was leaving for Vomo Island. "At this point, the cause of crash has not been identified (and) the aircraft and pilot are yet to be located," he said. Police and Fiji's civil aviation authorities are investigating. Fiji's military chief Commodore Frank Bainimarama has seized power in the Pacific island nation, rounding up key public figures loyal to the ousted government of Laisenia Qarase and declaring a state of emergency. Put this man in jail and throw the keys away. He has committed a crime by assisting. If you do the same in Australia and new Zealand , you will get the same treatment. How cheeky for a foreigner to come to our shores and play around with our politics. Is this Pig for real or what? From FBC website. The people of Qoma have asked the Prime Minister’s office to be exempted from the newly introduced Tobacco Control Decree. During his visit to the islands, Prime Minister Commodore Voreqe Bainimarama was told small business operators are able to earn a lot of money from selling loose cigarette rolls. Based on this, they asked to be exempted and allowed to continue selling rolls. However, Bainimarama told the people, he will not break the law and the restirctions have been introduced due to concerns by the Health Ministry. The Prime Minister told Qoma villagers they must abide by the the law at all times. Under the Decree, it is illegal to sell loose cigarettes. This is why the UN won't act when they have a useless white elephant of an office based in Fiji. It's better to lobby the Forum to close that hopeless UN office and divert the funds to the Pacific Regional Rights Resource team (SPC/RRRT) as I understand they do the BULK OF WORK on human rights education and advocacy in the Pacific region... and more importantly, are made up of pacific island professionals who understand context better than those who come from afar just to have a holiday in a "pacific island paradise". WELLINGTON, New Zealand (RNZI, May 23, 2011) - The Fiji-based United Nations Office of the High Commission for Human Rights is not commenting on allegations that Fiji’s military is torturing civilians. A spokesperson for the office says it is not commenting at this time. Last week, Lieutenant Colonel Ratu Tevita Uluilakeba Mara’s comments were the first by any of the 2006 coup leaders admitting that the military has been using torture in dealing with civilians perceived to be opposed to the regime. Colonel Mara left for Tonga after being charged with sedition, saying he feared he would not get a fair trial from Fiji’s military regime. Colonel Mara says people are taken to the barracks for interrogation, conducted by a select group of soldiers, who operate under the commander, Commodore Frank Bainimarama. Fiji’s interim government is also refusing to comment on the torture allegations. The UN Office of the High Commission for Human Rights, based in Suva, is tasked with increasing the knowledge of international human rights norms and standards by stakeholders in the region. Estonia is part of the European Union. Bai sud let the man go. EU should also be alerted on this matter. They will step into this situation. By the way Helen Clark is not the PM of NZ Wots she got to do with Fiji? Write to John Key n tell him, wots happening. THIS PEOPLE HAVE BEEN TAKEN IN BY THE POLICE/ARMY.ITS OVER 48 HOURS. IF YOU CANT LAY CHARGES SET THEM FREE. ALSO YOUR DECREE/GOVT IS ILLEGAL..
COMPOL SHOULD BE CHARGED WITH BAI/AG/CRONIES FIRST BEFORE ANYONE ELSE FOR TREASON. PROVE ME WRONG.I AM NOT A LAWYER . BUT DO UNDER STAND THE LAW. @ anon 11.37pm..you are a dickhead..he has the right to have a legal representation in court..stop judging the man yet cause you dont know if he is being falsely accused like the hundreds of people that have been falsely accused and interogated after these lawless monkeys have taken illegally taken over a government ..you dumbass fool...question is ..have you ever attended any school or are you someone like bainivuaka..who wants to get a free ride and conning anyone and everyone just to hold on to the reigns of power..Do you als know that is an unpardonable sin to falsely judge and accuse anyone..you stupid fool..
Helen Clark is with united nation. Need to alert and pressure UN. FREE FIJI FROM AG TALIBAN/BAI ANTI CHRIST. DECLARE A HOLY WAR ON THIS IDIOTS. PLS GUYS START WRITING TO UN/NZ/AUSS PM FOR HELP. .NO MORE RACIAL POLITICS -UNITED FIJI FOR ALL. I LIKE TO THANK C4.5 FOR UPDATING US. THE BLESSING WILL COME SOON FOR YOU ALL. I KNOW YOU K/D.KEEP POSTING MESSAGES. THIS C4.5 IS BETTER THAN FT/FL/FIJISUN./OTHER MEDIA/RADIO IN FIJI. LONG LIVE C4.5 AND CREW. Helen Clark is now a senior officer with the United Nations. How about the big lie about "getting rid of Corruption" and then the big lie of 2009. Soon there'll be another big lie of election 2014. How about that lie to Wilisoni ( World head of Seventh Day Adventist Church). Vuaka is the biggest liar of them all and Fiji Sun Editor must be an idiot too. How can he publish such things when he can see with own eyes how Vuaka lies time after time to the people of Fiji. @An 8:59 AM. Fiji Sun is a very big supporter of this taliban regime. AG TALIBAN was very pissed when Fiji Times went to Motibhais, who are not supporters of these fcktards. Fiji Sun is owned by CJ Patel & Company. In December 2009 when John Prasad was still PS for Finance, he issued a directive for all government departments, statutory bodies and government owned enterprises to advertise only with the Fiji Sun. This directive still remains effective today. This was and still is payback for the support that the Fiji Sun is giving the VB regime. It is also payback for work that people like Ajith Kodagoda, who is a director of CJ Patel, is doing for the regime like Chairman of FNPF. So folks, CJ Patel, Fiji Sun and Ajith Kodagoda must also be added to the list of companies and inviduals that are to be investigated for corrupt activities after this coup nightmare has ended and Fiji is returned to a democratic government. The vast majority of people in Estonia have no clue that their is a country called Fiji let alone know where it is, and least of all who Bainimarama or Mara are. @Anon 8.07am - Lykewise for you! *Risto Harmat has two children both of whom he has no contact with. *Last of all Risto Harmat is a conman, whos only care is where and from who his next free lunch is coming from. Oh ha!ha! @ anon 8.07am..Look who's talking..you are the lamusona and the dickhead at the same time..firstly you ulukau..I dont live in australia as you have implied..in fact I live in the heart of suva city and i always voice my opinions about the monkeys and those monkeys dont have the gut s to approach me cause they know very well what they will get..secondly ..you yourself are hiding behind anonymous on this blog..luveni kawa ca ..
You made the right decision about exploring opportunities in Vanuatu. You should go as soon as you get out of there! I'm sure your mates there will have a couple of Tusker's chilled and waiting and you don't have to worry about who you are seen with or what you say! Good luck bro, hope those stupid bastards get their head out of their arses and smell some fresh air for a change and realise how stupid they are! CJ Patel and Tappoo's are both families that r jealous of other guji's in Fiji. They are both trying to get to the top the quick and easy way. Unlike the Motibhai that have done this organically thru hard work and ingenuity.